Tonight, realizing information provided the military mobile subdivisions of Mostyska Detachment detained three people without documents during the area patrolling. The violators stopped few meters before the state border. According to their words, they were the citizens of Pakistan. Currently, the detainees are taken to the border service department to perform filtration actions. In the frames of the targeted preventive measures “Migrants” the operational units of the Border Agency together with the National police revealed four foreigner without any documents on the territory of Lviv train station. They all claim to have the nationality of Bangladesh. The protocols were prepared as to the violators under the Art. 203 of the CUAO being handed over to employees of the State Migration Service of Ukraine in Lviv region. 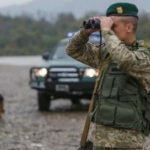 It should be noted that from the beginning of the targeted preventive measures “Migrant” performed by the State Border Guard Service together with other interacting bodies more than 1240 Protocols under the above mentioned article were drawn up. Total, more than 11,1 million fines were imposed. This entry was posted in Translated Media-News from Ukraine and tagged Bangladesh, Border Guard Service, Lviv, migrants, Mostyska Detachment, Pakistan, State Migration Service of Ukraine on August 15, 2018 by oksana.